Our ultimate urban escape vehicle will go pretty much anywhere your car can go! While there are no frills or fancy stuff, this off-road van is amazingly functional and comfy. Unique pop-up and pop-out style delivers plenty of space in a compact unit. 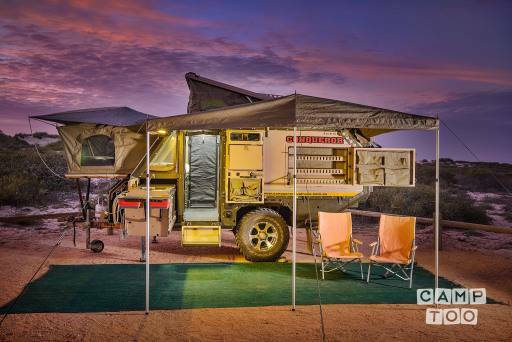 Camping in one of these is an awesome experience! To our knowledge, this is currently the only UEV-490 available for hire in Western Australia! With this van you can camp at awesome, remote locations off the beaten track such as Warroora Station, Ningaloo Station, Bullara or Giralia Station or in Cape Range National Park. Don't have a car to tow with? You can still experience a truly unique off-road camper while letting us do the hard bits: We can deliver, set up and pack down the van for you, please enquire! Absolutely NO storing of fish or bait in the fridge/freezer! Towing experience is required to tow this van! Large 4WD is required to tow. Off-road towing only for experienced drivers and needs our pre-approval. Please discuss your travel plans with us prior to booking. We are always here to help and try to accommodate all wishes – just ask! Our Conqueror UEV-490 must not be towed into the following areas: Any beaches or islands where exposure to salt water is likely; other locations (like estuaries) where contact with salt water is likely. Any areas where the Conqueror UEV-490 will be immersed in salt water, fresh water or muddy water where the immersion level will exceed the height of the wheel bearing caps, or on overgrown, narrow tracks which may cause damage to side panels. Damages resulting from failure to comply with the above restrictions will be the responsibility of the hirer. Please look after the van – we love it and use it ourselves too! Although it is tough-as-nails, it doesn't like being abused or miss-used. Je kan de caravan ophalen in Exmouth bij Sascha.